In addition to the brightness and gain adjustements, the virtual tone and volume pots let you tweak the tone in details. They can even be automated to follow the performance. Guitar tone modeler with electric pickups, acoustic guitars and hollow body emulations. 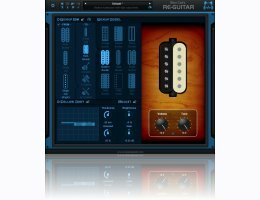 Download a demo version of Blue Cat Audio's Re-Guitar here.